Joints change with time, and as we age we experience aches and pains and a gradual loss of mobility. However, osteoarthritis, one of 150 different forms of arthritis, is not simply a matter of getting older. It is a degenerative process that results in relatively rapid deterioration of a joint. It generally affects people in their 60s and 70s, but can also occur among those in their 50s and younger. In most cases, a regular exercise program designed to maintain flexibility, muscle strength and endurance, will help people maintain their normal activity level. Wear and tear of your joints may occur due to aging, injury, prolonged poor posture, overuse of joints, or excess weight. 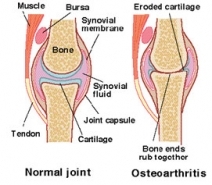 SYMPTOMS OF OSTEOARTHRITIS The early symptoms of osteoarthritis are recurring pain and stiffness in the joints. These symptoms are especially noticeable first thing in the morning or after sitting in one place for lengthy periods of time. Other symptoms may include swelling, obvious redness or a feeling of heat, and inability to move a joint. As the disease progresses, the damage to the joint increases. Osteoarthritis affects people in varying degrees. Despite permanent changes to the joint, some people may be pain-free, or suffer only mild or occasional pain provoked by episodes of increased use or minor trauma. For other people, symptoms can be disabling and, when the larger joints of the body are involved such as the hip or knee, the severity of the problem may require surgical treatment. The most commonly affected areas include knees, hips, hands, neck and back.PHYSIOTHERAPY MANAGEMENT OF OSTEOARTHRITIS Physiotherapists are health professionals skilled in the assessment and treatment of the symptoms of osteoarthritis. Your individualized physiotherapy treatment program will help: � Reduce pain; � Improve movement and posture; � Strengthen muscles; and � Improve independent function. Movement loss caused by osteoarthritis follows a predictable pattern depending upon the affected joint. A physiotherapist can diagnose the progress of the disease by measuring the mobility of the joint, the strength of the supporting muscles and the limitations on your activities. The physiotherapist will then prescribe an exercise and activity program �tailored� for your individual situation. An effective exercise program may help reduce the amount of pain medication you require, as well as: � Maintain or increase mobility; � Improve joint lubrication and nutrition; � Restore muscle balance and flexibility; � Improve circulation and endurance; � Improve strength and stability; and � Improve poor posture. Range-of-motion and stretching exercises will help maintain the maximum possible movement in the joint. Stretching will help maintain or restore flexibility to the joint�s muscles and tendons. Exercising in water is also beneficial as body weight is off the joints: exercising in water can also provide resistance to strengthen muscles. Other treatments provided by a physiotherapist may include heat, electrical treatments, hydrotherapy, splints, and advice on preventing further joint damage. These treatments are often used in conjunction with anti-inflammatory medications that control inflammation and alleviate pain. Rest, balanced with exercise and activity, is an important part of managing your osteoarthritis. Rest is especially important when joints are hot, swollen or painful. There are several other ways to help manage your osteoarthritis: � Always �respect pain� � don�t keep ignoring the discomfort; � Avoid overstressing joints � use proper body mechanics; � Avoid jerky or sudden movements when possible; � Maintain a healthy body weight; � Use splints or walking aids if necessary; and � Never overdo activity or exercise. A physiotherapist can also provide you with suggestions on how to pace your everyday activities, so you can continue to do them in a way that causes the least problem. As a general rule, if any exercise hurts then DON�T DO IT. Sometimes, simple changes such as wearing rubber-soled shoes or sitting in a different chair may help ease your symptoms. Regular exercises like swimming, exercising in water, walking or cycling are also recommended. If your osteoarthritis affects your neck or low-back, or if any joint appears hot, swollen or painful, do not perform exercises without first consulting your physiotherapist. WHAT IF I NEED SURGERY? Osteoarthritis is a degenerative process that primarily affects the bony surfaces of the joint; in some cases surgery may be recommended if the damage is severe and causing significant pain. The muscles surrounding these joints often become weak and tighten as a secondary effect of the disease. If you do require surgery, it is important to take steps to ensure that the muscles are as strong as possible, before the operation, so you can get the most benefit from the procedure. A physiotherapist can provide you with an exercise program that will help you maintain joint flexibility and optimal muscle strength in the months before your operation. Physiotherapists are healthcare professionals who help people of all ages and lifestyles gain and maintain their desired level of active living and physical mobility. With their applied knowledge and understanding of the human body in action, physiotherapists are able to help you to increase your mobility, relieve pain, build strength and improve balance and cardiovascular function. Physiotherapists not only treat injuries, they also teach you how to prevent the onset of pain or injury that can limit your activity.